Micah Buzianis (US 34) won the PWA Slalom event in Ulsan, South Korea last year and finished 3rd overall in the PWA Slalom rankings. There’s no doubt he is looking to improve upon last years results, with the first slalom event beginning on May 4th. All the pro windsurfer spent winter time on hard training, tuning gear and building strength and confidence for this first event of the season which is sort of benchmark of all the hard work made over past few months. Micah Buzianis is not exception from this rule and tougher with Phil McGain and MauiSails Team on Maui did all aspects of pro windsurfing training from A to Z. In this clip Micah talks about his gear choice for 2013 and what he expects for the upcoming PWA racing season, which will see 5 events in total. South Korea, Costa Brava, Turkey, Holland and Sylt. Gollito wins the PWA Surfworldcup in Podersdorf! 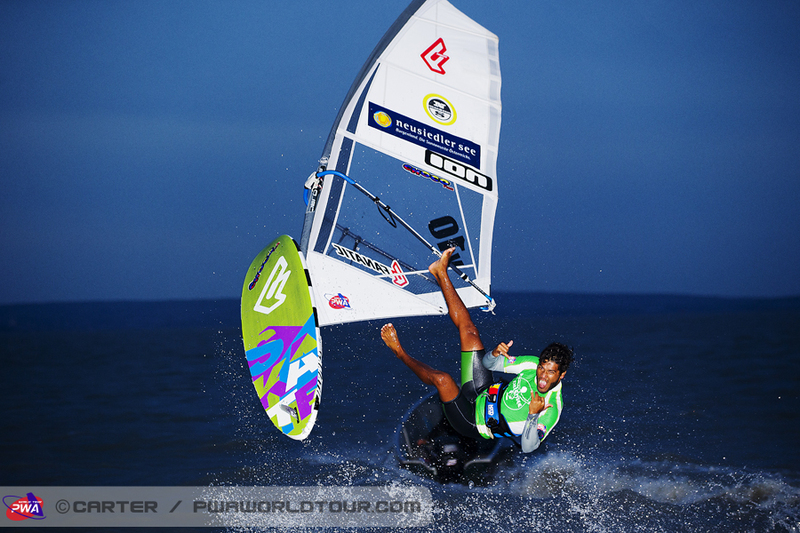 Now it´s official, Gollito Estredo is the winner of the 2013 PWA Freestyle World Cup in Podersdorf. With no wind today, no contest was run, so the results from the previous days stood. Well done Gollito! Steven Van Broeckhoven finished in second and Kiri Thode in third. A short and sweet windsurfing clip from Alistair McLeod with wave action from Victoria over the past couple of months. Steven van Broeckhoven wins the third qualification round with an Air Funnell into Burner. Also qualifying were Adrien Bosson and Max Matissek. There was little to no wind on Monday, until the wind picked up around lunch time. Canadian Philip Soltysiak was the first to hit the water. After 2 hours of attempting to start competition the winds did not cooperate, and a postmen was set once again, until the wind dropped off, and there was no opportunity to run the second single elimination, and competitors were dismissed for the evening. In the evening the 3rd and final qualifying round of the European tow-in stared at 8pm. Last years champion Steven Van Broeckhoven (JP / NeilPryde / Different) stole the show again as he landed an incredible air funnel into air burner 540, which earns him the highest score of the qualifying rounds. In second was Max Matissek, followed by Adrien Bosson in third. The final is set to run latter this evening. For a full recap of yesterdays events and an interview with Davy Scheffers (Fanatic/Gaastra) head over here on the PWA Website. Kiri Thode goes for a session at Lac Bay, ion Bonaire next to the Mangroves. Big thanks to Amado Vrieswijk, another hotshot from Bonaire who captured the action. 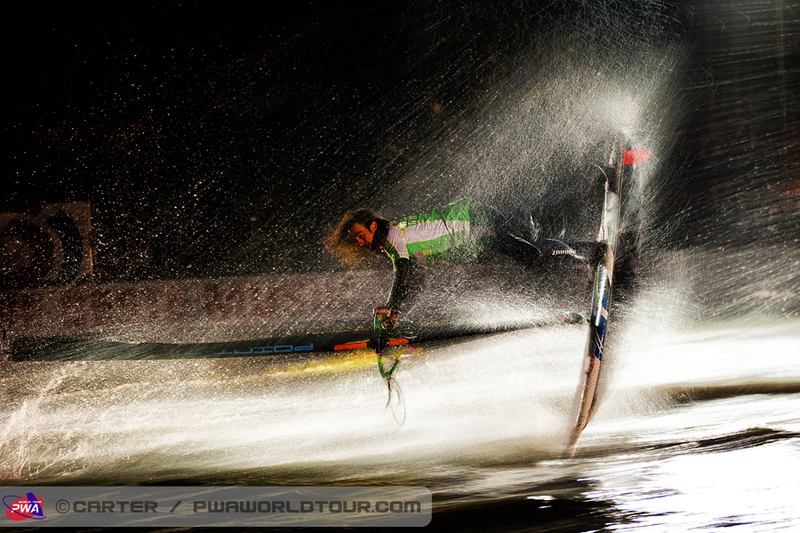 The best action from the Double Elimination at the PWA Surf Worldcup Podersdorf 2013. Thanks to Content Seven who has been there capturing all the action. Gollio Estredo won the double elimination, followed by Steven Van Broekhoven in second and Kiri Thode in third. The fourth day in the PWA Surf World Cup, in Austria has begun. A strong wind kicked in this morning, and the second single elimination began. But let us give you a bit of a run down on what’s happened so far. Friday featured hot temperatures, and light winds, eventually a light breeze picked up so a few sailors hit the water but it never materialized so no competition was held. The PWA caught up with Max Rowe and Gollito Estredo who had recently been on Maui, check out PWA’s day 1 report here. Saturday had everyone pumped as the forecast was looking strong, with a plan to run the whole double elimination. The action was intense but the 5x World Champion Gollito Estredo won, followed by Steven Van Broekhoven in second and Kiri Thode in third, no big surprises there! You can check out the PWA’s full press release on Day 2 for more details. Sunday had light winds, and saw little action, except for the tow-in qualification rounds. Two intense heats were held with the top three from each heat advancing to the Final, which is scheduled for tomorrow. From the first heat, Tonky Frans, Julien Mas, and Bjorn Saragoza advanced respectively. In heat two, Gollito Estredo, Taty Frans, and Dieter van der Eyken will advance. Feel free to check out the PWA report from day 3, with the men behind the Trictionary windsurf bible. Today has started with finicky winds, and heats being postponed. It’s now close to 4PM in Austria, with no wind. For an up to the minute of action in Podersdorf check out the PWA Live Ticker. 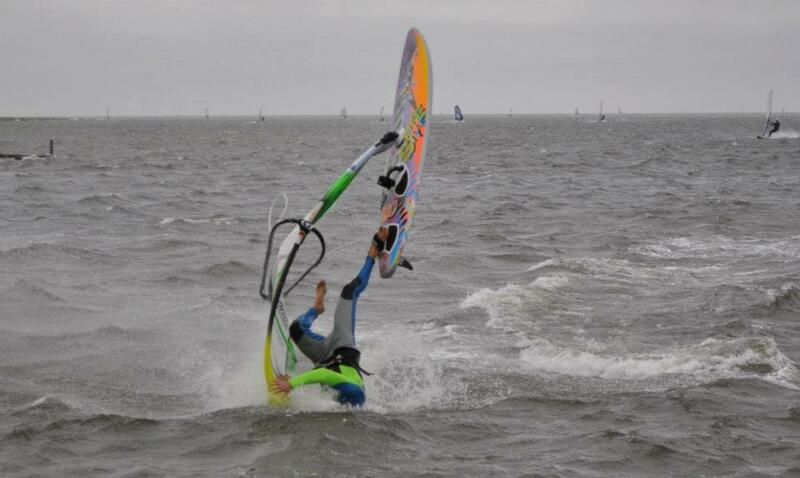 The best action in this clip from the 2013 Mondial du Vent which took place in Leucate, France. A quick clip of Josh Angulo and Pieter Bijl training in Maui Hawaii for there 2013 PWA season. Some fun sliding around at Julien Taboulet’s Wesh Centre, in Leucate France. Graham Ezzy hits a big Hookipa lip, and crashes hard, losing the gear in the process and having to swim for it. But falls are not fails– at least, not always. Falls, crashes, and wipeouts make learning possible and therefore are the opposite of a fail. Knowledge comes from the Falls. Graham has some views about The Importance of Crashes, Falls and Wipeouts, you can read onhis blog. Simmer Style and its history date back to the very foundation of hi-performance windsurfing on Maui in the beginning of the 80’s. Today, more than 30 years later, Simmer Style has become a truly complete company, offering everything you need to ride the Simmer Style way anywhere one can find wind. Top performing sail designs for every possible environment, superior masts and booms of the highest quality and performance, a wetsuit line-up that stands toe to toe with anything in the industry, super comfortable harnesses, innovative accessories, and last but not least, our newly launched board brand. Even thou we have grown from a small sail loft on the North Shore of Maui to a international company the foundation of the brand is still the same, a selfless love of windsurfing. No hype, no big show, just go out there and hit the wind and waves as hard as you can and let the sailing do the talking. That´s what we are all about.